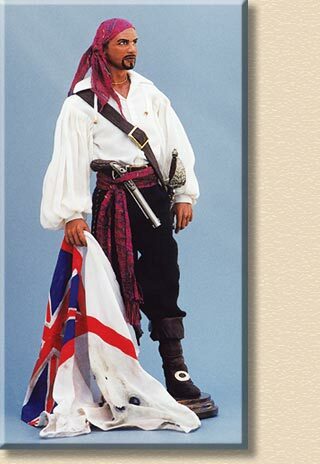 With pistol tucked in his sash, the pirate captain stands holding a tattered flag from yet another vanquished English vessel. Media: Head, hands and feet of tinted Super Sculpey, on a wire armature, with a cloth body. He wears brown leather boots, black pants and a white cotton shirt. He has a fringed magenta sash around his waist, and kerchief tied around his head. His sword hilt hangs from a leather belt across his shoulder, and his handmade pistil is stuck in his sash. Props: The flag is painted on fine white cotton, then torn, burned, and dirtied.